An enthusiastic youth came to discuss things related to spirituality. He is interested in meeting people on spiritual path, is a voracious reader, and incorporates many lessons into life. He was attuned to Reiki at a very young age, too young an age that he did not follow up the self healing practice. That sentence set me on thinking track. Since he is a medical student, I thought in terms of that profession. As a doctor, one does surgery. For the surgery to be successful, a lot of stringent preparations are done. The operation theatre is disinfected, the doctors spent ample time to scrub their hands and the instruments are sterilized with great care. Imagine a war scene. As many wounded soldiers are brought in, sometimes surgery is done in compromised situations. Because the priority is different in that situation. We cannot take that as the standard. I see a similarity here with meditation. Meditation just happens, we cannot do it. We have to create a congenial atmosphere for it to happen. 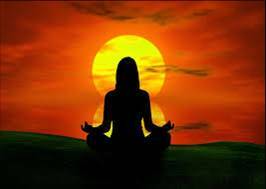 Some of the earliest written records of meditation (Dhyana), come from the Hindu traditions of Vedantism around 1500 BCE. The Vedas discuss the meditative traditions of ancient India. Just like surgical textbooks give guidelines, our sages, especially Sage Patanjali has given guidelines to prepare for meditation through their experiences with the Divine. Patanjali’s Yoga Sutra outlines the eight limbs of yoga, guidelines for living a meaningful and purposeful life. Dhyana or meditation is the seventh limb, where as asana or posture is the third one. Here, posture means the ability to hold the body still as a prerequisite for deep meditation. The spine is to be kept erect and the body relaxed. A sign of perfection in Asana is said to be the ability to sit still, without moving a muscle, for three hours. Many people meditate for years without achieving any notable results, simply because they have never trained their bodies to sit still. Until the body can be mastered, higher perceptions, so subtle that they blossom only in perfect quiet, can never be achieved. If somebody is trying to do meditation at the fag end of life, he/she may not be able to keep the body in a relaxed and still posture for extended periods of time. For them, there can be exemptions (just like performing surgery in a war zone). But if one is into the spiritual path from an early age, it really pays to follow what our sages’ wisdom dictates.